Dr. Douglas Willms, Professor at the University of New Brunswick and Canada’s Research Chair in Literacy and Human Development, was recently inducted as the President of the International Academy of Education in a ceremony that took place in Melbourne, Australia. The seat of the Academy is at the Royal Academy of Science, Literature and Arts in Brussels, Belgium. 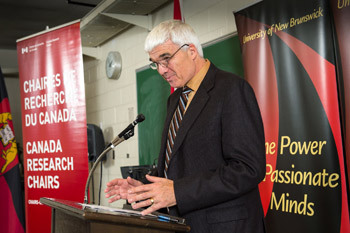 During his four-year term as President of the Academy, Dr. Willms will be working with his UNB colleagues and the Organisation for Economic Cooperation and Development to strengthen the capacity for educational evaluation in several low- and middle-income countries in Africa and Latin America. Educational Prosperity sets out a core set of metrics for success across the life-course which can be used to assess the capacity of a country to develop children’s developmental outcomes, set goals for increasing its capacity, and monitor progress towards those goals. Dr. Willms and his graduate students at UNB are currently working with school leaders in 32 First Nations schools in the design and implementation of Confident Learners, a whole-school and whole-community literacy program based on the science of literacy and instructional practice. Dr. Willms has published over two hundred research articles and monographs pertaining to youth literacy, children’s health, the accountability of schooling systems, and the assessment of national reforms. He and his colleagues at UNB designed the Early Years Evaluation (EYE), an instrument for the direct assessment of children’s developmental skills at ages 3 to 6, and Tell Them From Me, an evaluation system for the continuous monitoring of student engagement and well-being. These evaluation programs are being used widely across Canada in several other countries. Founded in 1986, the Academy is dedicated to strengthening the contributions of education research, solving critical educational problems throughout the world, and providing better communication among policy makers, researchers and practitioners. Its aim is to foster scholarly excellence in all fields of education by providing timely syntheses of research-based evidence of international importance, critiques of research, and its application to educational and social policy.